Summary: American-born seventeen-year-old Maya Aziz is torn between worlds. There’s the proper one her parents expect for their good Indian daughter: attending a college close to their suburban Chicago home, and being paired off with an older Muslim boy her mom deems “suitable.” And then there is the world of her dreams: going to film school and living in New York City—and maybe (just maybe) pursuing a boy she’s known from afar since grade school, a boy who’s finally falling into her orbit at school. There’s also the real world, beyond Maya’s control. In the aftermath of a horrific crime perpetrated hundreds of miles away, her life is turned upside down. The community she’s known since birth becomes unrecognizable; neighbors and classmates alike are consumed with fear, bigotry, and hatred. Ultimately, Maya must find the strength within to determine where she truly belongs. I was lucky enough to receive a copy of this book as a prize for a giveaway, and I'm so glad that I was awarded that chance, because it exposed me to an awesome story that I couldn't wait to read, and now I'm excited to share my thoughts with you guys! And then something super tragic happens, and Maya finds her life spiraling out of control and into danger for things she has no relation to. I really, really loved this book. I think it covered a lot of important (as well as swoon-worthy!) topics that had be flipping the pages from start to finish. There's also a lot going on here -- the first half of the book is so swoony and adorable, and although I had read the summary of the book before reading it, I absolutely was not expecting what happened. This book quickly addresses some really serious things happening to Muslims across the world (especially in America, where this story takes place), and what ensues is heartbreaking and terrifying and absolutely unacceptable. There's a lot going on in this book, but everything that happens has an important moral weight that absolutely cannot be ignored. This book will make you laugh and cry with its adorable (and sometimes frustrating) romance, but it will also tear your heart in two and open your eyes in ways you may not have ever been expecting. I enjoyed this book so much to the point that I tore through it in just over two days because I kept wanting to find out what would happen next. Things started to escalate really quickly past the halfway point of the book, and I sort of blinked in surprise when I got to the end because I couldn't even believe that it was over -- I was so enveloped in the story that I hadn't even realized it had come to an end. And as I always say, a book that draws you in from the beginning to the end and makes you lose track of time in the process is definitely the mark of an excellent story! As for what I didn't like about the story, there isn't much to talk about. I just felt like the second half of the book was a completely different story from the first -- while there were little inserts throughout the whole book about what was going to happen later on, the reader doesn't start to put together the pieces of what's happening until the midway point of the book (or at least that's what happened with me), and then all of a sudden things pick up really fast and take a grim turn and it doesn't really feel like it fits in with the previous half of the story that came before it. So that jarred me out of the story a little bit, just being shocked and feeling like I was reading a totally different story -- no matter how good that story was. I think if maybe this scary event happened earlier on in the book, or maybe some other instances of this racism/Islamophobia was made more prevalent in the first half of the book, it wouldn't have felt so jarring when reading it. But just to be clear: it wasn't the event itself that was jarring. I think that was excellently done. I just feel that its place in the story was what threw me off a little bit. But that's the only thing that I can really say I wasn't pleased about in this book. But other than that minor thing, I really enjoyed this book and I will absolutely be recommending it to everyone I know. There were lines that made me laugh so hard that I took pictures of them and sent them to my boyfriend and Emily and Amber, moments where I felt myself rolling my eyes in complete frustration with Maya's parents, moments where I was swooning due to the adorable love story, and moments where I was white-knuckling the pages with anticipation and fear. This book totally takes you on a ride, and it's definitely a ride that you'll remember in the best of ways. So don't miss out on it! Overall, I really loved Love, Hate & Other Filters. If you aren't sure if you should be adding this book to your TBR, I'm here to confirm that you absolutely should. Samira Ahmed explores and discusses some really important, heavy, deep topics in this book that everyone needs to witness and understand. And there's also tons of romance to go around and have you swooning! 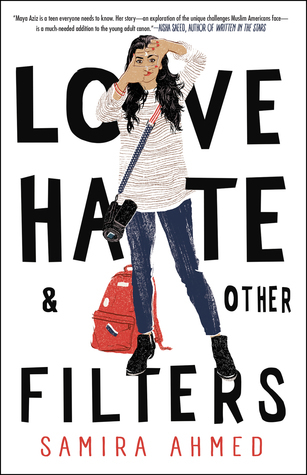 As the title suggests, Love, Hate & Other Filters will take you on a rollercoaster of emotions that you absolutely won't be prepared for, but you will find yourself falling in love with nonetheless. Hats off to Samira Ahmed -- I'm looking forward to reading more of her work in the future!